P1090002, originally uploaded by Aaron78. Walking along Copenhagen's walking street, Stroget. Biking is not permitted here so she's being a good law-abiding citizen. 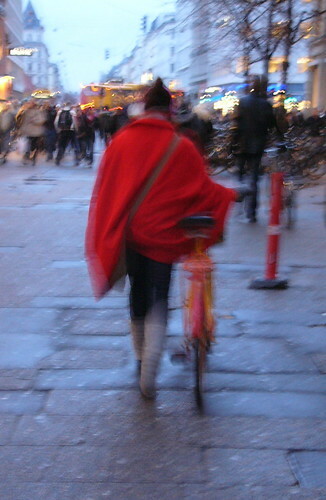 Plenty of people do though, especially once the bars and cafes close on a cold winter's night. I've been seeing a lot of lovely cape coats in street style sites and wondered if they'd make you feel like a chic super hero, in this case you have it! my wife being a designer i can confirm that capes and ponchos are very hot this cold winter.